She loves collecting jewelries, she’s still single and hoping soon she will be getting her own partner too. I told her to send it to me and will put it on my fashion galore. 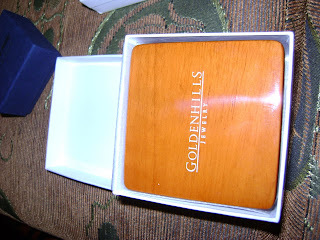 She bought this in Megamall at GoldenHills Jewelry. I told her very scary to wear this fortune earrings hahaha! This entry was posted on 5:14 AM and is filed under Butterfly Earrings , GoldenHills Jewelry , Silver Earrings , Wfashion . You can follow any responses to this entry through the RSS 2.0 feed. You can leave a response, or trackback from your own site. hhahaha...sis mao jud that's d word..kaigit...lol! katae-tae jud sa kamahal hahaha...what a word man oi..
Salamat sa pag agi sis, mao pa ako paghuman ug pangwak-wak. hahaha! tug nako. ngeks ang mahal nga for a pair of earrings..but if she can afford why not..jewelries are good investments anyways..
wow.. my gosh.. that's over 1thou bucks lola.. pastilan hadlok pod na^ suot-suoton oi.. nah ayaw jud i-disclose ang pangalan sa imong friend ky basin timan-an nya sundon ky labnihon ra diay to.. ipa-amping lola.. muahh!